Amending the Budget—But is it Enough? In order to balance its books this year, OUSD will have to make some mid-year adjustments to the budget it adopted last June. The current plan proposed in OUSD’s budget presentation for tonight’s school board meeting is to amend the current budget by $7.2 million. Of that amount, $1.2 million would be to bring the required reserve levels to the state minimum. The other $6 million is in case there are costs that were (1) not budgeted for, or (2) they were budgeted for, but the current cost projections may be too low. Establishing how big of an adjustment to make is a crucial first step in this process. It is also an opportunity for the Board of Education to show strong leadership by asking for clear and transparent information to the public (in the presentation and the thinking behind it) and taking the actions that will help OUSD make the necessary changes. First, OUSD’s total budget is somewhere in the area of $700 million dollars. $6 million is a small buffer. That is not very much, especially for a system with some serious financial challenges. Second, the state and county leaders have made clear that IF OUSD appears to be in danger of not being able to pay its bills in the future, it may mean taking action. in order to retain local control, the Board has to make a clear statement that they are willing to make the changes necessary to improve OUSD’s finances. The proof is in action. Third, it is unclear what, if any, of the expenses below are included in the $6 million figure. However, as you can see, there are a number of important expenses that simply cannot be covered by the $6 million dollar figure. Some of them can, but not all. What are the consequences if the number is too low? If the proposed adjustment is too low, it might lead OUSD back into a situation like last spring in which OUSD is having to make additional cuts on a short timeline, and that is incredibly disruptive to the entire system. So, the key question is whether the $6 million dollar number reasonable? It depends. If the $6 million is already slated to be spent on likely expenses, then it is definitely too low. If it is truly a buffer then maybe it is enough, but it still is a very slim margin, especially given the overages of the last two years and the disruptive cuts from last spring. Additionally, there are a number of possible issues that will need to be addressed (see chart below). Thanks for reading. The coming weeks will be critical for OUSD. We will share information and opportunities to give feedback back as quickly as possible. If you know of others who would want to know more about the budget please share this blog post with them and this link to sign up! Also, check out Supt. 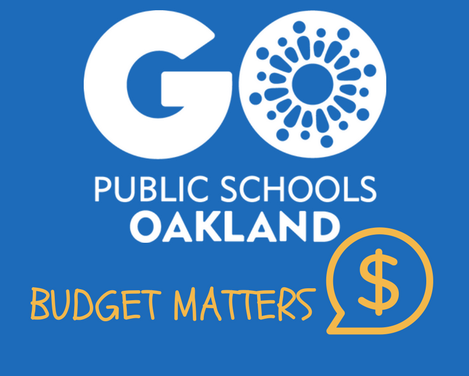 Johnson-Trammell’s video about the upcoming budget issues and what it will take to set OUSD on the right course. When FCMAT completed its snapshot last year it identified many many financial issues. However, it was issued after the budget had already been passed. This estimate is based on hiring four staff members at $125K total compensation, but it could be for other purposes. When OUSD financial books are audited by an outside firm, it is possible there will be findings and fines. Setting aside money for this would guard against additional possible mid-year cuts. Possible overages based on previous budgeting experiences and overspending. If you want to end this terrible roller coaster, OUSD has to save for a rainy day. Ending the year at the state minimum is not prudent and does not meet the Board’s own policy. Last year, the Self-Insurance Fund dropped by $8.0 million (from $14.6 million to $6.8 million). $4.0 million would recover ½ of the amount spent down last year. When OUSD “closes the books” it figures out if its budget estimates are correct or if they overspent. For both of the last two school years, it overspent its budget estimate by ~$5 million.